Editor’s note: The following was taken from a speech delivered by Gov. 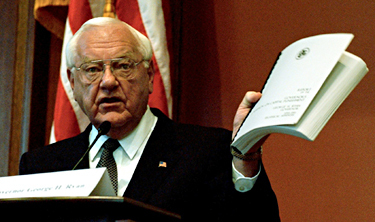 George Ryan to University of Chicago Divinity School on June 3, 2002. The speech was part of a forum sponsored by the Pew Forum on Religion and Public Life, in which Gov. Ryan was asked to speak upon how his religious and personal views have impacted his actions on the issue of the death penalty. The complete speech can be viewed at: http://pewforum.org/Death-Penalty/Governor-George-Ryan-An-Address-on-the-Death-Penalty.aspx. This speech was given after Gov. Ryan had instituted a moratorium on death penalty sentences and prior to commuting all persons sentenced to death to life imprisonment just prior to leaving office in January 2003. I was raised as a Methodist in a small town south of here, Kankakee, Illinois. My family was not the kind to wear religion on their sleeves. It was difficult because most drug stores open early on Sundays. But we did go to church when we could. But what I said in that interview is that I have prayed over this issue. In the end, all of us who believe, who have faith, are taught certain precepts from the time we are young. We are taught what's right and what's wrong, whether Christian, Muslim or Jew. We are also taught about eternal life and celebration hereafter. One of the most fundamental of those religious beliefs is to protect the innocent. As God told Moses in the book of Exodus, it is up to us to show justice and mercy: "Do not deny justice to your poor people in their lawsuits. Have nothing to do with a false charge and do not put an innocent or honest person to death, for I will not acquit the guilty." We weren't doing a very good job of protecting the innocent in Illinois, until two years ago when I declared what is, in effect, a moratorium on executions. Up until then I had resisted calls to issue such an order. I had always supported the death penalty. I always thought only the guilty were punished and sent to death row for committing the most unspeakable crimes. I'm from Kankakee, Illinois. We always prided ourselves on trying to keep our small town feel. Kankakee was not immune to crime, but there was always a sense of community outrage. We always wanted to see the bad guy behind bars. Catch, them convict them, throw away the key. That was the sentiment I heard growing up in Kankakee, working in my father's pharmacy. Why wouldn't I? You've heard me recall how I voted in the General Assembly to put the death penalty back on the books in Illinois. I believed the ultimate punishment played a role in our society for crimes so horrendous that death was the only penalty that fit the crime. In 1976, after the U.S. Supreme Court ruled the death penalty was constitutional, I voted as a member of the Illinois House of Representatives, to put the death penalty back on the books. During the floor debate on the capital punishment bill, an opponent of the death penalty said to those of us supporting the bill, "How many of you would like to throw the switch." That was a sobering thought. I would never want to be the executioner, to "throw the switch." I'd never want to be responsible for that. But as a legislator, I was far removed from making that kind of life or death decision. By reinstating the death penalty, my colleagues and I in the General Assembly were tough on crime. It was up to prosecutors, judges and juries to determine who was guilty of a capital offense. I never questioned the system. But in looking back, it is clear that I only dealt with the issue in the abstract. In those days, my opinion was just that, my opinion. I had no say on how the capital punishment system would be administered and applied. I'm a pharmacist, not a judge or a lawyer. I had no idea that more than twenty-five years later, I would have the good fortune to be elected Governor. And then, I would, in effect, be the one to throw the switch. In most of the thirty-seven states that have the death penalty, the Governor makes the final decision about whether to grant a stay of execution. That is an awesome responsibility, the most difficult faced by a governor. Should they live, should they die? Imagine having that decision on your shoulders. I must admit, I didn't realize the enormity of it until I was faced with it. It has been a long, sometimes strange trip for me on the death penalty. I went from being the lawmaker from Kankakee who voted to reinstate the death penalty, to the governor who declared the country's only moratorium. We reinstated the death penalty in 1977 in Illinois and since that time we have executed twelve death row inmates. But, thirteen times, innocent men were convicted of capital crimes by judges and juries based on evidence they thought was beyond a reasonable doubt. On thirteen occasions, innocent men were condemned to die. And on thirteen times, innocent men were exonerated after rotting for years on death row. For that to happen even once is unjust. For that to happen thirteen times is shameful and beyond belief…. When the thirteenth inmate was exonerated, I did the only thing I could do, the only thing any governor could do--I halted executions. That was the easy part, the hard part was to find out what had gone so terribly wrong. The hard part was to try to answer how our system of justice became so fraught with error, especially when it came to imposing the ultimate, irreversible penalty…. So I appointed some of the smartest, most dedicated citizens I could find to a commission to study what had gone so terribly awry….But I am also deeply concerned. My commission's report seems to confirm my worst fears about our capital punishment system, that it was fraught with error at every painful step of the process. The report reviews, at some level, every capital case that we have ever had in Illinois, but it took a closer look at the 13 inmates freed from Death Row and exonerated. Most did not have solid evidence…. But my concern is the system in Illinois, fraught with error and convicting and condemning the innocent along with the guilty. When I made my decision to declare a moratorium, I never consulted the opinion polls. Only since my decision do I notice them. A recent Gallup poll was interesting: Only 53% of those polled believe that the death penalty is applied fairly, while 40% say it is applied unfairly. Among non-whites, 54% believe that the death penalty is applied unfairly. When given the sentencing alternative of life without the possibility of parole, 52% of Americans support the death penalty and 43% favor life imprisonment. 82 percent of respondents oppose the death penalty for the mentally retarded, 73% oppose the death penalty for those who are mentally ill, and 69% of Americans oppose capital punishment for juvenile offenders. While that same poll still showed strong support for capital punishment - 72 percent - it is clear the American people are as concerned with fairness now as they have ever been…. A lot of people have called my stand courageous. Those are nice words, but they are nonsense. It was just the right thing to do. I also must decide what to do with the nearly 160 death row inmates who were convicted under our current broken system…. How has my faith influenced how I have faced this difficult issue? How do I deal with fundamental questions of justice and fairness and morality? I just try to follow my heart and my conscience. I have tried to remember what I've learned from my faith and my family. And, perhaps like you, I might reflect upon what God told the Israelites in Isaiah, "Keep justice and do righteousness." That, I pray, is what we will do. Thank you, and good night.